Laser transfer is a very appealing method of garment decoration. It offers a great range of features for decorators who want to provide their customers with high quality printed transfers on light and dark apparel. It can be used effectively to create everything from transfers with simple vector graphics to full color photographic images. And the range of supported applications includes cotton, polyester, cotton-poly blends, leather, tote bags and more. The challenges in laser transfer media so far have been cost and complexity. Laser transfer decorators have been vexed by transfer media that is costly and difficult to use. 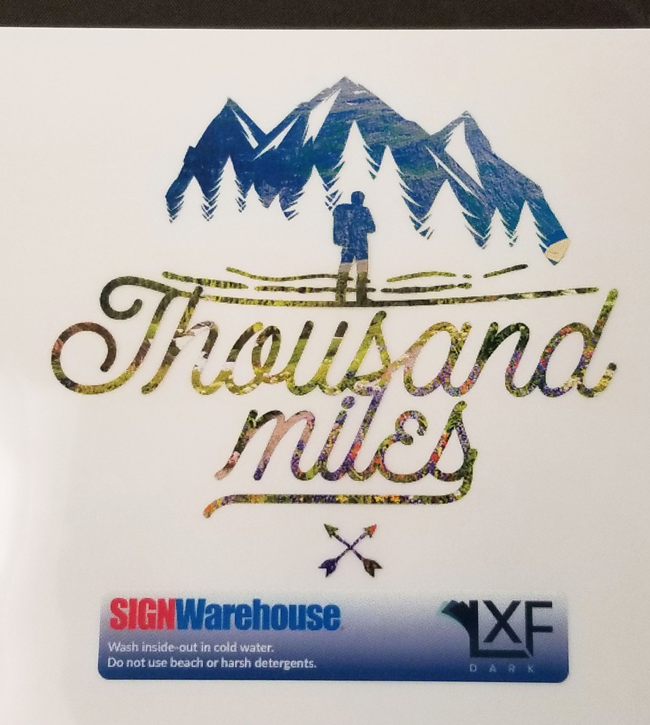 SIGNWarehouse is pleased to announce that we’ve solved those problems with the introduction of our new laser transfer media, Logical Color LXF Dark. What makes Logical Color LXF Dark different? Read on. Logical Color LXF Dark is a two-step, self-weeding laser transfer media comprised of a transparent A-Foil sheet and an opaque adhesive sheet. It’s a familiar formula with a significant upgrade. For those unfamiliar, let’s start with the basics. Two-step laser transfer papers are designed to be used with laser transfer or textile transfer printers that use process color and white toner. Fig 1: Two-step laser transfer paper requires a white toner enabled printer and a good swing-away heat press. These include the Oki WT and Uninet iColor printers. The white toner is printed over the CMY process color. Then that sheet is placed on a heat press and pressed face to face with a sheet of adhesive-coated paper. When these sheets are separated, the adhesive coating sticks only to the toner on the printed media. This process adds two layers of white beneath the printed CMY process color toner. One layer of white toner and one layer of white adhesive. The two layers of white under the CMY toner provide an opaque white underbase that supports opaque and vivid colored transfers, even when applied to dark or colored garments. This is the first step of the ‘two-step’ laser transfer process. Experienced laser transfer users know that the ‘A Foil’ and ‘B Paper’ formula is already in use by Forever Laser Dark and iColor 2-step transfer media. The polymer coatings used on self-weeding laser transfer papers require very specific and uniform levels of pressure and heat. Both Laser Dark and iColor Standard require low pressure on the first step of the process and very high pressure on the second step. This drastic change in applied pressure can cause confusion as the heat press is adjusted back and forth. Too much pressure on the first step transfers little white blotches of adhesive to the A Foil. This is a costly do-over. Too little pressure on the second step can result in a transfer that comes off in the wash. This results in an upset customer and an even more costly do-over. Not every heat press has a pressure gauge, and not every heat press applies the same amount of pressure. So getting this right is critical, but unfortunately, getting it wrong is too easy. Logical Color LXF Dark solves this problem with a new coating chemistry that activates the adhesive paper at the same pressure setting as that needed to seal the transfer to the garment. The first and second step are both done at high pressure. This means you don’t have to keep changing the pressure settings on your heat press. You can go from marrying the papers to pressing the garments and back with ease. And the cycle time for the first step is only 80 seconds, which is up to 33% faster than the other brands. So LXF Dark is simpler and faster. That alone is pretty good news. But there’s another important LXF advantage. Like the other Logical Color heat transfer products, LXF Dark is also a great value. It’s our most affordable two-step laser transfer solution. Each package of LXF Dark includes both A Foil and B Paper. A box of 100 A4 sheets of LXF Dark is only $219.00 or $2.19/transfer. That’s a savings of 30 cents/ transfer. It doesn’t seem like a ton of saving, but over time plus the savings and profits can really add up. And since LXF Dark is easier to use, your material cost from botched transfers will plummet. That’s savings times two. 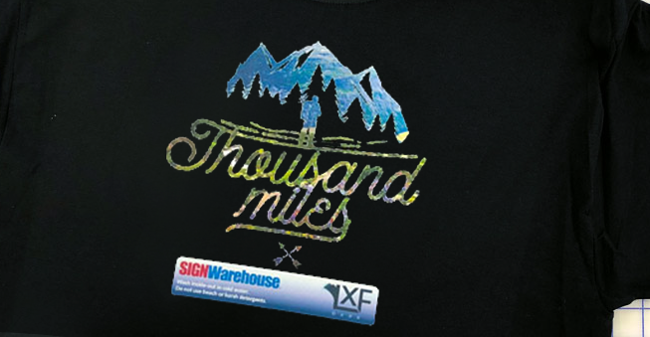 SIGNWarehouse has been offering laser transfer solutions for over 8 years. In that time, we’ve worked with all the top manufacturers of self-weeding laser transfer paper. Logical Color LXF Dark is the easiest, most effective solution we’ve ever seen for decorating dark garments. So how does LXF Dark self-weeding laser transfer paper work? 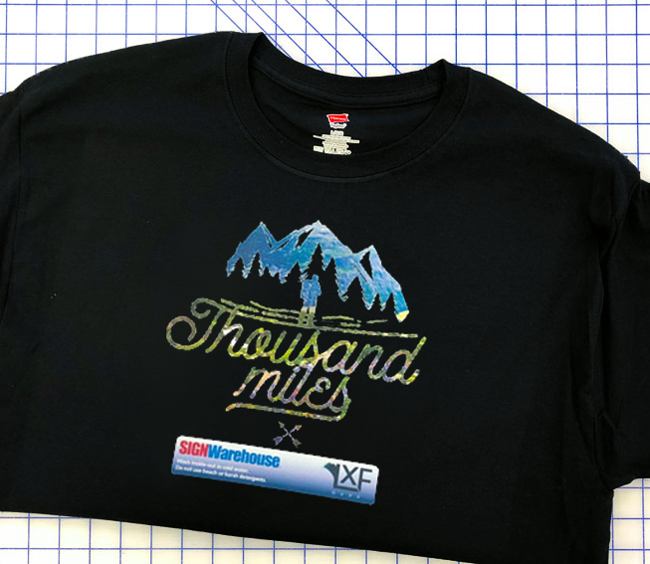 We should note here that we strongly recommend swing away heat presses for any laser transfer paper. Signwarehouse has three different EnduraPRESS swing away heat presses: the 9″ X 12″ SA12, The 12″ x 15″ MF15 Mutli-Function Combo press, and the workhorse SD20. We also offer high-quality swingaway models from Geo Knight, Hix and Stahl’s. All of these are compatible. LXF Dark is compatible with OKIWT and UniNet iColor white toner textile transfer printers. Okay, now that we have the swingaway disclaimer out of the way, here’s how to use LXF Dark. Click here to view and download the PDF instruction guide. Here’s a brief summary of the ‘2-step’ laser transfer process. Design your transfer in your favorite graphic design application. For best results create the file on a transparent background and save it in .eps, .png, .pdf, or .psd format. If you use Forever TransferRIP, CADlink Digital Factory or iColor Pro-RIP, set your media type to transparency or foil. Load LXF Dark matte side up in your printer’s multi-purpose tray (or matte side down in the bottom tray of an iColor 550). Fig 2: The print on the A Foil sheet will be mated to the B Paper to apply an adhesive coating. Set your heat press for firm pressure (about 50 psi). After printing, it’s time to press paper A and B together. Set the heat press to 302 – 320°F (150 – 160°C), and when your press has reached the preset temperature, close it for at least 30 seconds to pre-heat the lower platen. Set the press cycle time for 80 – 110 seconds (more on this in a moment). The B paper adhesive coating must be face-to-face with the printed image on the A foil. Cover both with a sheet of standard copy paper or a Teflon sheet. Close the press for 80 – 110 seconds. Smaller transfers or images with 50% coverage or less can be coated in 80 seconds. Larger images or images with higher coverage should be pressed for 110 seconds. As soon as the press opens, keep the A foil and B paper on the press table and slowly peel the B paper away from the A foil. This applies a layer of white adhesive over the toner ( Fig 3). Place the garment on the heat press and place the A Foil transfer on the fabric right-reading, glossy side up. Cover with a Teflon sheet and press for 30 seconds at the same firm pressure setting. Remove from the press and allow to cool to room temperature, then roll the foil away from the apparel. 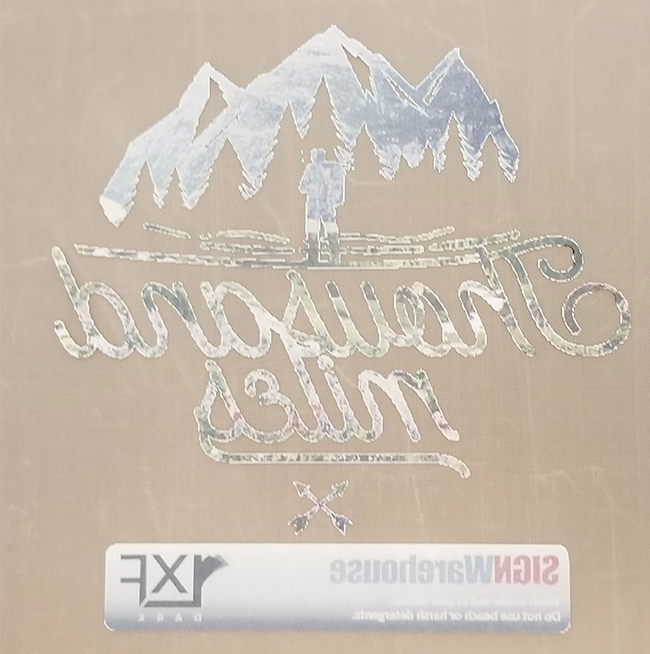 To ‘fix’ the new transfer, place the garment on the press, cover with a sheet of silicone paper (included in the box of LXF media) and re-press for at least 25 seconds. Wait five seconds and remove the silicone paper. mildly stretch the transfer while warm to maximize flexibility. Final result: An intricate, soft and colorful transfer that looks and feels great on dark garments. No weeding required. Astute observers might say, ‘you have 12 steps for our ‘two-step’ laser transfer paper’. We would say, ‘right you are’ and this is normal. All such self-weeding transfer papers work in about the same fashion. It’s not a simple process and there is a learning curve. There is some finesse involved and the PDF instruction sheet linked above includes some tips to help you get up to speed more quickly. And with LXF Dark, at least you don’t have to change the pressure settings from the first step to the second. We offer LXF Laser Dark in the two industry standard sizes, A3 and A4. A4 is 8.25 x 11.7 inches and A3 is 11 by 16.5 inches. So they’re roughly the same as letter and tabloid. Each size is packaged with both A Foil and B paper sheets in one box and each box comes with a sheet of silicone paper for ‘fixing’. For convenience and economy, we offer both in packs of 50 or 100 sheets. Boxes of 50 A4 sheets cost only $129.00. A box of 100 A4 sheets is only $219.00. OKI Pro 8432WT, 920WT, or iColor 600 owners can opt for the A3 sheets, which start at only $219.00 for a box of 50 sheets. Logical Color LXF Laser Dark is the terrific all-around value. The simpler workflow with just one pressure setting and one temperature setting for the entire process makes getting consistent transfer easier. It reduces costly errors, shortens the learning curve and improves profit and productivity. On top of all that, you get great color, opacity, and durability. We’re really excited to be able to offer such a great dark garment laser transfer solution at such an attractive price. We think you will be too.